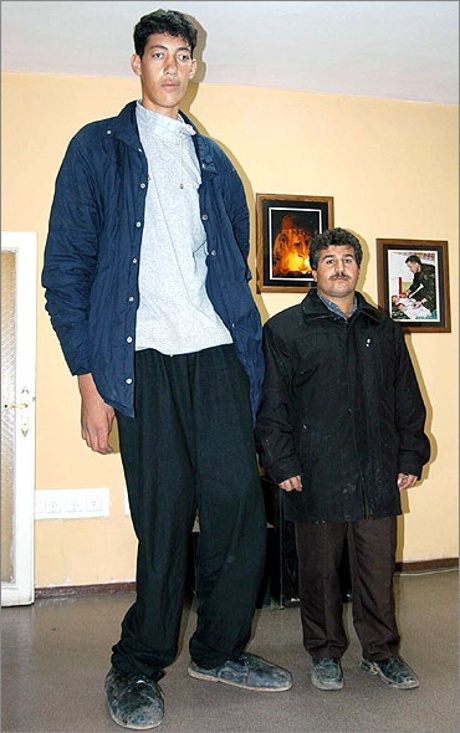 Sultan Kosen, a 25-year-old man from Turkey, has not one, but three Guinness World Records in his possession. One of them is his recent ordination as the new world’s tallest man. Also, while getting measured up for his new crown, it was discovered that Sultan also has the world’s largest hands and longest feet. He’s 8 feet 1 inch tall, has a hand span of 10.8 inches, and has 14-inch-long feet. Sultan’s unusual proportion is a result of pituitary gigantism. While surgery removed the tumor from his pituitary gland that caused Sultan’s unusual growth, like most people his size he’s got a host of medical problems that have left him needing crutches to walk and limiting his employment possibilities. Plus there are the expected problems like finding a car, buying clothes, and getting specially-made beds. Apparently, being super tall doesn’t exactly help the dating life, either. As Sultan said in his interview with The Telegraph: ”It was really difficult for me to find a girlfriend before but hopefully now that I’m famous I’ll be able to meet lots of girls.” Good luck, buddy. Being at the top of the celebrity height chart should help you get dates!